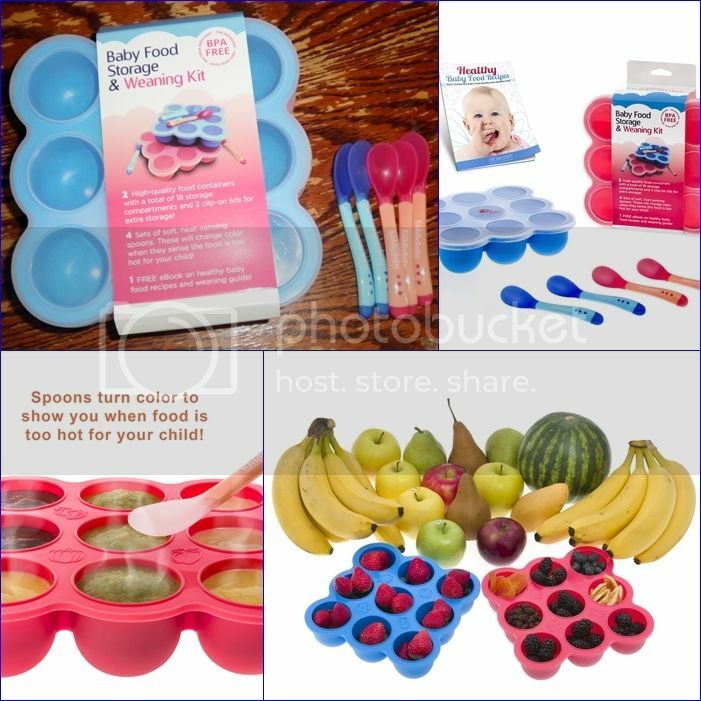 What I love: KiddieBobs Baby Food Storage and Spoons Deluxe Set is the most versatile baby food set! They allow you to perfectly cook and store portion amounts of food. Each set comes with two trays, with 9 holes each that hold about 2.5 oz of food, which is about the size in a baby food jar. Super durable, they are microwave, freezer, oven and dishwasher safe! They are made of 100% silicone that's been FDA approved and free of any BPA's, phthalates, PVC, latex, lead and other toxins so you know you are feeding your baby safely. The airtight and flexible silicone lids are awesome for easy storage, just snap them on top and they are ready to go! Because it's made of silicone food stored can be easily be popped out from underneath with a gentle squeeze! Cupcakes, jello, puree, vegetables, ice, the possibilities are endless. Ariel is teething so they worked really well so far to make her strawberry and blueberry filled ice pops to chew on! She loves them! This kit also comes with 4 soft and flexible spoons that change white to warn you when food is too hot for your baby. They are perfect for Ariel's mouth at 17 months but I can see them being perfect for babies as young as 6 months. They also have a nice grip on them and she' able to comfortably hold them herself really well.